Ride Stats: 116.2 miles (187km), 16,000ft (4880m) of climbing, 8:30:04 riding time (upwards of 10 hrs elapsed time). Riders: Solo ride, starting 1.6hrs after official 6am start time, passing a large number of riders that started at 6am. Equipment: Specialized Allez, stock triple (min 30x25 gear), 28mm Specialized Armadillo road tires. Weather: One of the hottest days of the year! Rumored +106F (+41C) heat index, temp well into 90’s, and barely a breeze at times. After completing the D2R2 last year, I said I probably wouldn’t do it again. It takes a lot out of you, can take a while to recover from, and lasts so long that the final 50 miles turn into ugly sufferfest. But I thought it would be good training for the Everest Challenge this year, so I signed up just before the cutoff time on bikereg.com. I knew it would be warm, but probably dry with slight chance for T-storms. I was worried about a couple things on the ride this year. Foremost was the heat. I don’t do as well as most when it gets really hot. And really hot it was. The heat index during the ride was rumored to hit 106F in Greenfield. This is about as miserable as it gets in New England. I left home with a full Camelbak (100oz) with an extra dose of Endurolytes added. Plus I took a Ziploc bag with more of the magic white powder with me. The other thing I was worried about was dry conditions. It hasn’t rained over the last 10 days or so in much of the area. The D2R2 ride entails over 80 miles of gravel roads. These can get loose as marbles and wash-boarded up without rain to keep things “glued” together. Last year it rained just before the ride and conditions were perfect. The course was modified this year. Since a couple bridges were re-opened, more dirt and climbing were added right at the beginning of the ride! Last year the ride entailed 14,500ft of climbing per Topo 6.0, this year just over 16,000 feet. 1. It seems the Garmin Map76 GPS screen update isn’t always fast enough when going 40mph down a hill. I’d get a few hundred meters past a turn before I realized it. 2. My factory base road map had very few of the roads in it I was riding on. So when I got to multi-way intersections, it wasn’t clear which way I had to turn until I started going down one of them. I picked wrong a couple times. 3. The ride is in fairly mountainous region with heavy forest growth. Many times when I’d descend a narrow, deep valley with tree cover, I’d lose the signal and miss a turn. 4. Then about 1.5hrs into the ride, the GPS kept shutting off. I had just put in fresh batteries. The unit is spec’s to operate 12 hours in warm conditions with alkaline batteries. Maybe not while navigating? I’ve gotten 6hrs in winter before while logging a track (cold weather depletes batteries quicker). I was furious. I could have smashed the thing to pieces. So I had no means of fastening the cue sheets to my bars. I had to stuff them under the leg elastic on my shorts inside plastic bag. Real pain pulling that out every couple minutes. So all that time I hoped to make up just vanished by frequently fumbling with or even stopping to read the cue sheet. Plus I spent a lot of time to make sure I had the track correct in Topo before the ride. I made it to the first feed station, about 40 miles into the ride, just in time. There were still over a dozen riders milling about. PB&J sandwich, small pack of cookies, and refilled my 100oz Camelbak with powdered Gatorade and Endurolytes. I’m really glad they had powdered Gatorade there, as that is what I train with. It does not use fructose like most pre-mixed sport drinks do. I learned here that a rider was hurt bad on one of the curvy dirt descents. Rumors were potential neck injury. After the ride, I heard it was just a collar bone. But a couple days later I learned there were a couple of mishaps. The first rider went down spectacularly on high speed dirt descent, possibly the same set of corners I almost bit it on. He did crack two vertebrae in his neck after all, but will be alright. After talking briefly with Rol and Tom (guys I know from hillclimb events), I pushed off. I knew Dave and Beth were doing this ride on the tandem. They planned to roll by 6am. I was wondering if I would be able to catch them. Dave is wicked strong on rides like this and punished me thoroughly in the last 50 miles of it last year. Beth is riding strong this year too. But those hills. My marriage would not survive if I tried to take my wife on this ride with our tandem. We’ve done some pretty fast century rides, but D2R2 is a whole different beast. Approaching the 50 mile mark, I start seeing more riders. Riders walking. Riders laying off the side of the road stretching out cramps. Riders standing, hanging over bars in exhaustion. Not good. It wasn’t even that hot yet, and there was still 60-70 miles to go with many major climbs. The climb up Archambo Rd is brutal, a claimed 27% maximum grade. It’s not that long, maybe 0.3 miles, but it is loose gravel. There were more foot tracks than bike tracks. I managed to clean it again, but my 30x25 ratio was not nearly low enough. Last year I was geared down to 1:1 and felt I needed more. This hill hurt me bad. Shortly after the Archambo Rd climb comes the Hillman Rd climb. Some say this is the hardest climb on the course. I’m not sure of that, but I am sure about how badly I suffered on this climb. It goes on forever, and my cadence must have been about 40rpm. I saw more riders walking up this one. After a long, well deserved descent, another humungous climb ensues. I believe this starts on Franklin Hill Rd. After cresting high point on Amidon Rd, an initial descent on well groomed gravel got my speed up to 40mph. I reached the second feed station at 70 miles into the ride completely cooked. The 30 miles between feed stations 1 & 2 are the hardest miles of the course in my opinion. You know you still have 46 miles to go after this with three brutal climbs among many smaller climbs. I filled my empty 100oz Camelbak again, but this time I had no more Endurolytes to add. There were riders at this station asking for salt tablets. It was now very hot and riders were cramping up. I wasn’t, but I was overheating big time and exhausted. A pattern was starting to emerge. The feed stations all seemed to be at the bottom of hills. This meant you would immediately start climbing again after stuffing PB&J sandwiches in your gut. I nearly lost mine going up Stage Rd after second feed station. No time for things to settle. Just go right back into granny gear and start grinding away at barely faster than walking speeds. This was first of three major climbs on this 30 mile leg. After screaming paved descent to Green River Rd, riders get a well deserved break. The course follows the Green River on dirt road for about 4 miles. This has downhill bias to it (goes down stream). But when you round the near 180 degree right hand turn for Nelson Rd, you almost hurt your neck looking up at the angle you have to climb. The steepness lets up after a while, but the climb does not let up for along time. I caught up with Dave and Beth on the tandem on Green River Rd. They were approaching survival mode at that point, but still talking to each other. The third climb of this leg, and the final major climb of the route, is Patten Hill. This beast is claimed to be 20%, starts paved, but then becomes skinny gravel road of which the surface is continuous embedded apple sized rocks. And the grade never lets up. Eventually, the grade slackens slightly as you come around this bend. But horror of horrors appears before your eyes. It keeps going up for as far as you can see, and it ain’t a gentle grade either. I lost it on this section. Glad nobody was around. I had enough rough, sketchy, 4mph, barely keep the pedals going climbing by this point. Plus, I was so hot I was getting the chills. Scary. After a brief descent, the final food stop is reached. A local family hosts this one in their front yard. They had a garden hose with ice cold water. Dousing head with 50F well water in 100F+ heat index after 7.5 hours of riding? Priceless! I got to wash the quarter inch of mud off my legs too. No, there was no mud on the course. But continuous sweat running down legs with high speed dusty descents picked up a lot of crap. You could not see any skin through it. Talking with the hosts there, we learned only about 15 riders had been through there so far. That means either a lot of the 100+ riders registered bailed on the ride, skipped the Patten Hill section, or I passed an awful lot of them. After filling Camelbak with weak Gatorade (stomach no longer tolerating full strength, up to 400 ounces so far for this ride), I was off. No more biggy hills, but there were a couple 10 minutes grinds on the remaining 13 miles of the course. I could do no more than soft pedal by this point. I got back to the fairgrounds in exactly 8.5 hours riding time. Not sure of total elapsed time, but was probably in 9.5-10hr range. I spent at least 15 minutes at each of the three stops and stopped a few times with my early GPS woes. Dave and Beth got back with the tandem around 20-30 minutes after I did, with a riding time that might have been around 10 hrs. Apparently Patten Hill was not kind to them, where the extreme exhaustion and too many hours in the saddle together resulted in a “quarrelsome incident” (details of which I won’t go into). My wife and I would not have made it that far on our tandem. So despite the heat, rough loose gravel conditions, riding alone, and 1500ft more climbing than last year, I still managed to complete the ride in 11 minutes less riding time than last year. I did not expect this. I consumed nearly 400oz (about 3 gallons, or 12 liters) of fluids. I was not peeing it out either. Being the second time I did this ride, I question whether I will do it again. I might think no now, but I’ll probably come up with some excuse next year why I “need” to do it again. Epic rides like this are addictive. I think I got excellent training value out of it for the Everest Challenge. One thing for sure I will do differently: go back to 1:1 gearing. I made all the hills in a 30x25 ratio, but it will probably cost me an extra day or two in recovery because of it. Just because you can do hills in a big gear doesn’t mean you should. 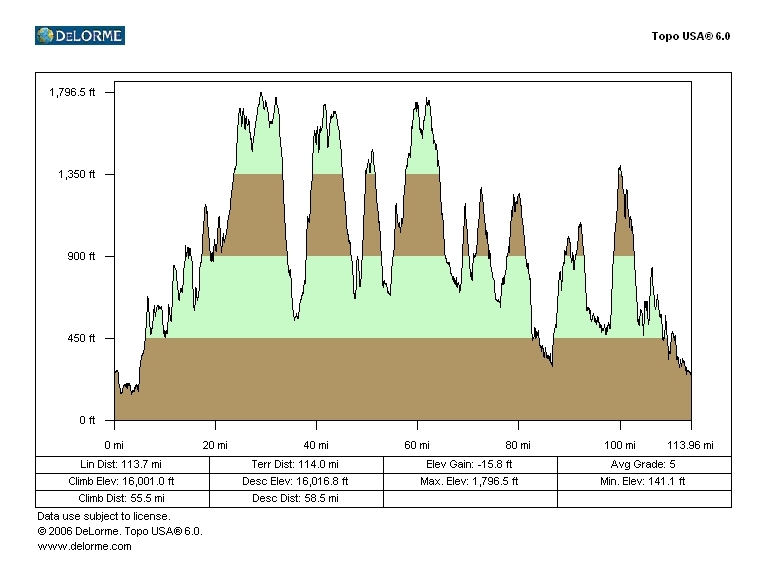 I probably could have climbed some of these hills faster in an easier gear and had less muscular fatigue after the ride. I probably spent around 30% of the ride time-wise in my 30t granny ring. Middle ring on a triple is 42t, too big for most of the climbing. This ride is about as scenic as you can get in western Massachusetts and southern Vermont. You can go for an hour at a time and never see or hear a motor vehicle. You might encounter farm animals in the road though. Many hilltop vistas are reached. The scenic vistas must be earned, making it all the more rewarding. I saved a copy of this year’s 187km cue sheet here. The route can also be found on bikely.com, but note that Bikely smoothes out many of the rolling hills and greatly underestimates the total vertical. Free showers and post ride meal totally hit the spot. The food was catered by Mesa Verde restaurant. They had three kinds of burritos, three kinds of enchiladas, salad, and seasoned rice. The burritos must have weighed two pounds! I was so full I couldn’t quite finish it all. A meal that was commensurate with the ride!